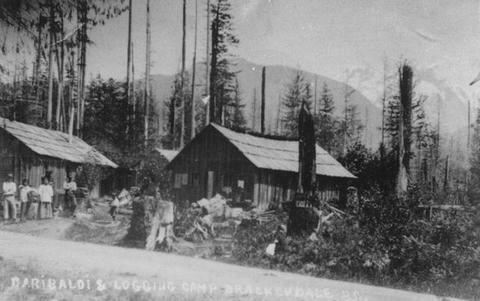 Lamb's logging - Lefurgy Ltd (Garibaldi & Logging Camp, Brackendale). Research compiled by Eric Andersen, 2011: Lamb Bros. Logging camp ca 1912, on present site of Garibaldi Cemetery. The Company ran a rail car loading operation similar to that of Squamish Timber Co. two miles to the north. The Cheekye log flume crossed this camp site, later occupied by a Japanese logging company. Andersen, Eric. (2011). Along the route of the Cheekye log flume. Posters lent to the Squamish Public Library, Squamish, BC.